During the course of its history as a hotly contested piece of legislation, then a polarizing law, the Affordable Care Act has flirted with death more often than James Bond. Now it finds itself in the crosshairs once again. Politico reported on Sunday that Senate Majority Leader Mitch McConnell has said he is “seriously considering” holding a vote on a bill sponsored by Senators Lindsey Graham and John Cassidy that would dramatically shift the funding of America’s health care from the federal government to individual states while gutting key provisions of the Affordable Care Act. Graham has publicly begged for Trump to help build support for the bill, and it appears to be paying off. The president asked about the Graham-Cassidy proposal in conversations this weekend in Bedminster, New Jersey, and is likely to call senators this week while he is in New York at the United Nations, the administration official said, though much of the work will be done on the senior staff level. This time around, the GOP has a hard deadline: September 30, which the chamber’s parliamentarian has ruled is the last day this year that senators can use the budget-reconciliation process to pass legislation with only 50 votes. If Republicans did manage to pass the bill before then, the House would have to approve it as-is, since the Senate could not revise text after the deadline. As before, getting to 50 will be a steep climb. 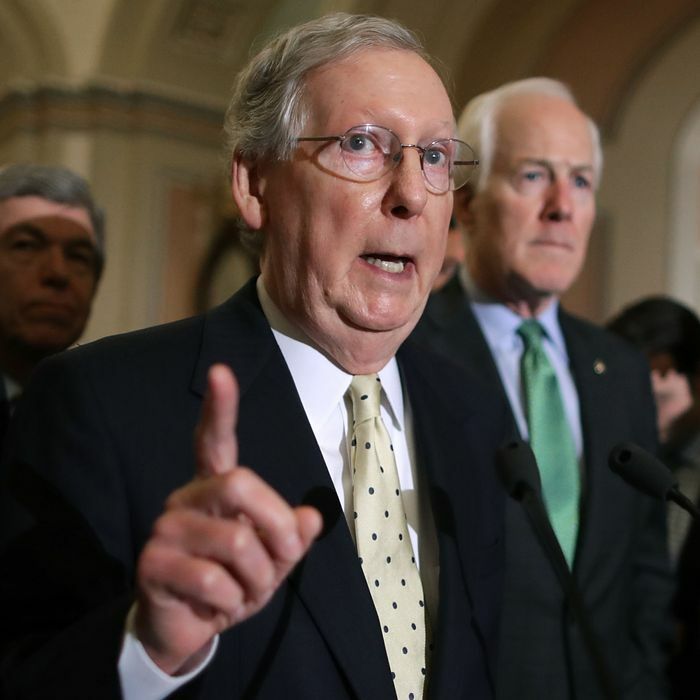 If any three Republicans vote no, the bill is toast, and if McConnell knows the bill won’t reach that level of support, he probably won’t bring it to the Senate floor, assuming he wants to avoid another humiliating spectacle like the one in July. John McCain, whose famous thumbs-down nixed the skinny-repeal effort in dramatic fashion, again protested the partisanship of McConnell’s legislative strategy on Sunday, endorsing the approach of Senators Lamar Alexander and Patty Murray, who have recently held bipartisan hearings on how to stabilize the Affordable Care Act marketplaces. Democrats and liberal activists have started to rally in earnest against the bill, though the miniscule amount of coverage it has received, after so many prior Obamacare-repeal news cycles, likely works in the GOP’s favor. And then there’s the Congressional Budget Office, which will release an expedited score on the legislation at some point between now and September 30. However, the CBO announced on Monday that the score would reveal only the budgetary impact of the bill, not the expected health-care coverage loss. Whether Republicans would make the unprecedented move of voting on a massive piece of legislation without really understanding its effects on the insured remains to be seen, but there are some indications that they might take that radical step. So, Republicans have a very long way to go in a short period of time to achieve their dream of exploding America’s health-care system. But it can, and just might, happen. In any case, we’ll soon know if the Affordable Care Act can survive its latest near-death experience. This piece has been updated to reflect the Congressional Budget Office’s statement on Monday.